Do not forget to do regular backups of your database. Open your database. Click on 'Backup' button in the menu. Choose the location for backup. Write your backup on an external HDD, Flash or Compact Disc. Use button '...' (3) To provide a default location for automatic backup. The current backup path is shown in the 'Backup folder' field (2). 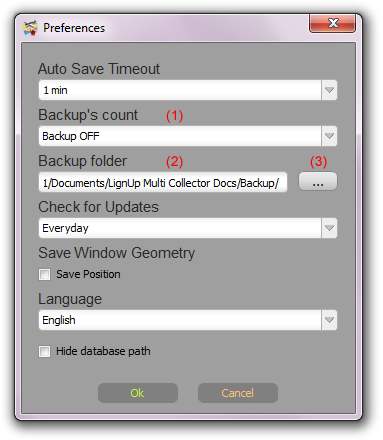 To activate the automatic daily backup, choose a value in the 'Backup's count' dropdown list (1). This value represents the number of backups to preserve. For example, when it is set to 3, Multi Collector will keep 3 recent backups. When new backup is created, the fourth will be automatically erased. An automatic backup is activated every time the database is opened, but only once per day. To deactivate the automatic backup, set the 'Backup's count' dropdown list (1) to 'Backup OFF'.